The Incredibles 2 is a superhero family action/comedy animated feature from Pixar, released in June 2018. It’s the sequel to The Incredibles, the first in the series, released way back in 2004. 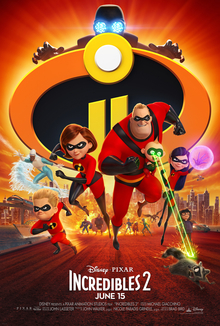 The Incredibles 2 picks up where the first one left off, after the superhero family has had their first big win together thwarting Syndrome’s plan to set up superheroes for failure, and with the emergence of the Underminer’s big drilling machine from under the city. The family joins together again to save the city from the Underminer, and soon after Elastigirl aka Helen Parr, Mr. Incredible aka Bob Parr, and Frozone aka Lucius Best are approached by rich superhero-sympathist brother-and-sister business partners Winston Deavor and Evelyn Deavor, who want to start a new campaign to make superheroes legal again, starting with financing Elastigirl to fight crime and improve the public image of supers. Bob and Helen talk it through and decide that she should do it, in part to make a more accepting future for their children Dash and Violet. Bob stays home to watch the kids while Helen goes out on this mission, and their baby Jack-Jack begins manifesting superpowers. Soon a new supervillain rises, Screenslaver, who uses hypnosis to turn others into his minions. Coco is the newest adventure/comedy animated film from the ever-popular moviemakers Disney/Pixar, released in November 2017. The movie tells the story of Miguel, a young Mexican boy who is an aspiring musician in a family where music has been forbidden since Miguel’s great-great-grandfather abandoned his family to pursue his music career. Miguel idolizes the legendary musician Ernesto de la Cruz. 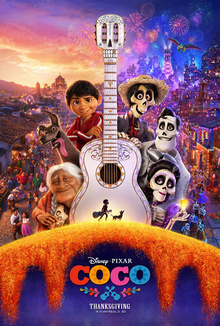 Miguel is determined to enter the music competition on the Day of the Dead (the one day of the year when the dead are allowed to come back from the other side to visit their living relatives, as long as those relatives hang photographs of them in their honor), when his grandmother discovers his guitar and smashes it. Still determined, he breaks into the tomb of Ernesto de la Cruz to steal the guitar enshrined there. Stealing from the dead on the Day of the Dead curses him to be sent to the land of the dead (with his stray dog friend Dante tagging along) where only his dead relatives can free him back to the land of the living.